Chance will host the November 18 episode of the show. 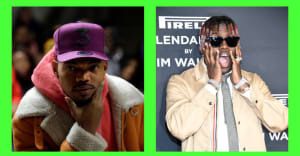 Chance the Rapper will make his hosting debut on the November 18 episode of Saturday Night Live and, in the promo video for the upcoming show, the Chicago native is wondering how to get rid of his pre-show jitters. He proceeds to lead a dance party with the whole staff. Eminem will be joining Chance on the upcoming SNL episode as musical guest. Chance made his debut on the show in 2015 and has performed twice. Last year, he was an Emmy nominee for Outstanding Original Music and Lyrics for his performance on the show. Thumbnail image: Tommaso Boddi / Getty Images.